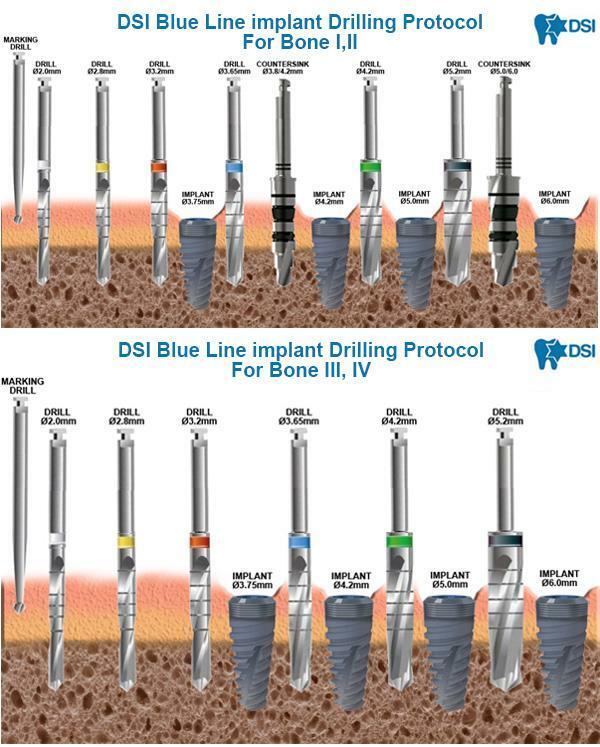 We at DSI are offering you the most popular implant type for immediate loading on a completely new level of standards. Increased insertion speed combined with high initial stability. Clean surface morphology with unique threads for improved BIC and reducing bone stress. Universal internal hexagon connection that fits a wide range of prosthetics and restoration parts. Micro-grooves on the coronal area to minimize shear stress at the crestal zone. Two spiral channels stemming from the apex to adjust the implant integrity. Wider threads for improved bone compression. Rounded blades on the apical area for preventing damage to the anatomical structures. Radical SLA surface treatment for excellent biocompatibility and drastically reduced possibility of abruption. Thanks to great stability of these implants DSI Blue Line Spiral Implants designed with a patented technology especially good for immediate loading in wide variety cases of different bone types. 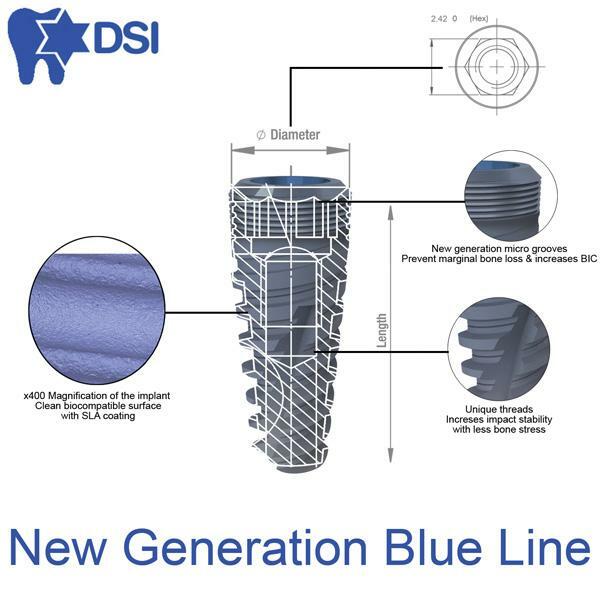 DSI Blue Line iconic "aggressive" geometric shape includes dual threads, two spiral channels stemming from the apex, micro-grooves on the implant top and a changing thread thickness along the implant. As a result, soft bone is collected and compressed during the implantation creating strong and balanced platform ready for immediate loading. Proper implant surface is crucial to attaining correct surface roughness. Highest surface purity levels help to achieve optimal osseointegration, increase the success rate of Bone to Implant Contact (BIC), increase the healing process and growth tissue around the implant while eliminating possibilities of post-surgery infections. Sulfuric and Hydrochloric acid, which are both made of cold worked titanium. SLA surface demonstrates incredible biocompatibility, excellent mechanical strength as well as osseointegration properties. Current drilling protocol is based on vast experience collected by worldwide specialists using our implants. We recommend using a drill with a slightly smaller diameter than the implant itself in a soft bone density cases. In cases, where the bone is dense, it is suggested to use a drill with a similar diameter to the implant. However, please remember there may be changes applied to the protocol and it is very important to examine each and every case on its merits. Based on the circumstances of performing the procedure, and the condition of the patient’s individual needs. Following the proper drilling protocol ensuring rapid bone building around the implant and minimizes the chance of abruption. Name: DSI Spiral Implant "Blue Line New Generation"
The cover screw is integrated into the top of the implant key. Surface Treatment: Radical SLA technology. Sterilization: Gamma Irradiation, Sterile Double tube. For the implants and all prosthetics are compatible with all Interna-Hex System, Such as: Alpha-Bio, A.B , ZIMMER,Adin, Cortex, MIS and more. Height for Ø3.8mm (slim) #3, #4, #5, #6, #7. Height for Ø4.6 (regular) #2, #3, #4, #5, #6, #7. Height for Ø5.5 (wide) #2, #3, #4, #5. Height for Ø6.3 (Wide) #3, #4, #5.